A free Wi-Fi hotspot beams broadband internet from atop a public phone booth in July 2012 in Manhattan, New York City. So-called "Super Wi-Fi," which offers a bigger range than existing hotspots, is being deployed in the United States and generating interest in a number of countries, including Britain and Brazil. Move over Wi-Fi, there's a new wireless technology coming. So-called "Super Wi-Fi," which offers a bigger range than existing hotspots, is being deployed in the United States and generating interest in a number of countries, including Britain and Brazil. The long range and use of the broadcast spectrum could allow wireless signals to travel farther than Wi-Fi—in theory as far as 100 miles (160 kilometers)—although for practical reasons the range will probably be only a few miles. The first deployment of Super Wi-Fi came last year by Rice University in Houston, Texas, followed by another earlier this year in Wilmington, North Carolina. A coalition of organizations has announced plans to deploy Super Wi-Fi to college campuses in rural areas starting early next year in a project called AIR.U, backed by Google and Microsoft. Dan Lubar of the WhiteSpace Alliance, an association dedicated to new wireless technology, said he sees Super Wi-Fi gaining momentum in the US and other countries with unused broadcast spectrum. "Everybody understands the value of this spectrum," he said. "It is the biggest swath of spectrum and has the most favorable characteristics." Chipmaker Texas Instruments recently joined the alliance, suggesting that equipment makers are ready to start making Super Wi-Fi equipment. "It's definitely going to be here in visible ways by the middle of next year," Lubar said. Calabrese said that because of a lack of compatible equipment, most of the early Super Wi-Fi deployments are being back converted to regular Wi-Fi signals. At some point soon, he said, people may start using air cards or dongles to capture Super Wi-Fi. Gerry Purdy, an analyst and consultant with MobileTrax LLC, was more cautious about prospects for Super Wi-Fi, saying it may take several years to gain traction. "It's a good utilization of spectrum, but I'm more conservative than some people," he said. "Building chipsets takes times, software standards take time; I don't think people should have false expectations." The most vocal criticism comes from the Wi-Fi Alliance, which has a trademark on the name Wi-Fi and fears consumers will be confused by incompatible technical norms. The group said it supports the use of unlicensed spectrum for broadband but that Super Wi-Fi "does not inter-operate with the billions of Wi-Fi devices in use today" and does not "deliver the same user experience as is available in Wi-Fi hotspots and home networks." Although the name is the most controversial part of Super Wi-Fi, that did not come from the backers of the technology, but from the FCC and chairman Julius Genachowski. "I wish we had thought of that. 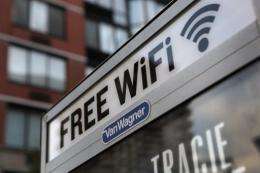 We had been calling it Wi-Fi on steroids," said Calabrese. For bidirectional use, it'll be limited by the performance of the electronics on the mobile device. For best performance, the antenna will have to be larger (phone of the future - with rabbit ears). Longer distance communication will also require higher power transmitters. Hard to get around the noise floor. The television band doesn't really have a lot of bandwidth available. One ordinary TV-channel is roughly 20 Mbps one way, which limits the practical number of customers per cell to just a handful. The article states that the achievable range is 60 kilometers. With such a wide coverage and limited bandwidth, it's understandable that the data cap is set at 5 GB a month. Those limitations aren't much different from satellite links, which can be stymied by heavy rain, trees, a small amount of snow on the dish or even the wind blowing the dish out of alignment. I'd jump to SuperWiFi in a heartbeat. Phones are already pretty large, I'm not sure what the problem is of putting two thin bands on the sides. Also, I'm sure the signals could be better focused toward the router for efficiency. I currently don't know how to do it, but I'm sure it's not impossible. Here's a novel idea - get rid of all television and use their band widths to augment Wi-Fi. I mean there is hardly any intelligent programing, mostly just commercials and "the news" which is both commercial commercials and gov. commercials. I tried to watch CNN and after the the third 5 minute commercial in 20 minutes I gave up. TV's a total waste of a resource as is. If they are using television bandwidths, it might affect the transmissions if the weather goes bad. The range might be farther but the quality of the Wi-Fi is questionable. My satellite internet has no such problem and I get over 500 inches of snow per year. There's usually one storm in the spring and one in the fall where the snow has just the right moisture content to block signal. Otherwise, I can handle as much snow as the dish can hold. However, I may be in a unique situation in the high Rockies. I guess at lower elevations the snow is wetter and more problematic. Rain is never ever a problem for me, but I've heard it can be in tropical areas where the rain drops are larger. Trees and wind are installation challenges easily overcome.